MDM Porbandar Recruitment 2018.Namaste Dosto, Welcome to the Gujarat Bharti Website. Here Daily We update latest Gujarat Bharti 2018. Also here we update Job Notifications, Results, Study Materials, Call letters, Syllabus, Data Sheets And other job-related stuff. So Here we come with Mid Day Meal Project Porbandar Recruitment 2018. 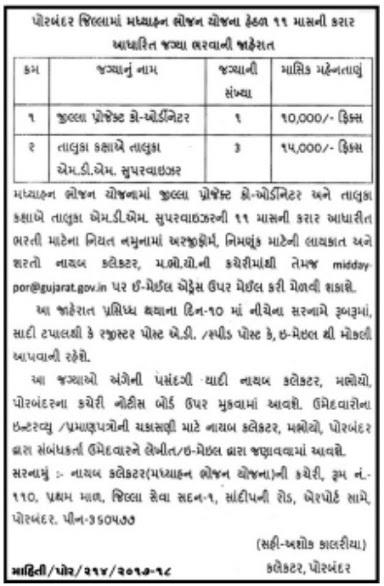 MDM published an official notification for Recruitment of District Project Coordinator & MDM Supervisor for 11 posts. So For more details, Check out below for Age Limit, Educational Qualification, Selection Process, Application Fee and How to Apply etc..